Shocking 100 mph High-speed Chase is Lead by Women With Baby Strapped in The Back Seat. 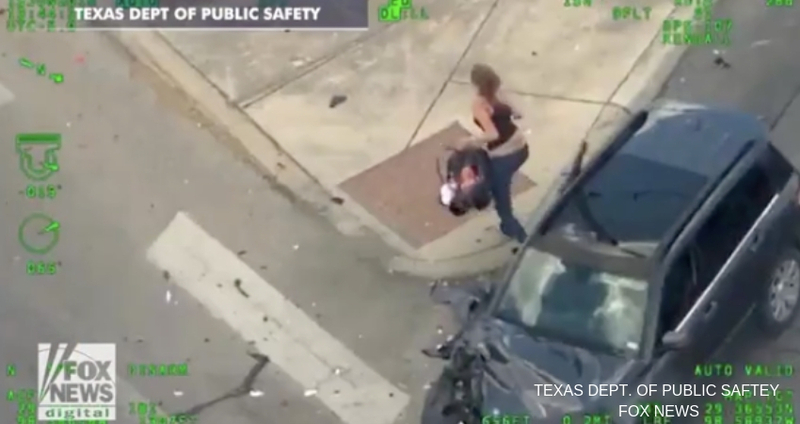 Shocking video was recently released by the Texas San Antonio Police, which shows a high-speed pursuit involving two people, one was the driver a female later identified by DPS and her infant that she further endangers by running through oncoming traffic. June 15th a 29-year-old woman by the name of Caitlyn Rodriguez was pulled over in her Mercedes SUV, in a traffic stop along Highway 90 near Lackland Air Force Base during the stop the State Trooper finds the female is wanted for numerous warrants, which then led to the 29-year-old to flee the scene in her vehicle. She is seen going over 100 mph and zooming in and out of traffic putting not only her life but her babies life in great danger. During the chase a state trooper is seen setting up an attempt to stop the vehicle, the tire deflation device was unsuccessful although the female sustained a flat tire she manages to barely keep control of the vehicle. With the helicopter following the vehicle from above, she is seen crossing over a very busy intersection before going off the highway, quickly after she is seen in the video to drive straight into oncoming traffic before running through a red light at fast speeds with little control due to the flat back tire caused by the spikes.. Eventually leading into a collision, the Mercedes clear efforts to brake were very unsuccessful, and the vehicle smashed into a white pickup who was stopped at the red light, totaling the front of the car. With nothing else to do the female is seen exiting the vehicle, then reaching into the backseat to grab what appears to be a car seat which is confirmed to have a baby inside. Caitlyn then frantically runs through traffic before she makes a wild attempt to hijack another woman’s car which also had another child in the back seat. Quickly officers are seen arriving at the scene where shortly after Rodriguez is then pulled from the car, slammed to the ground and then put into cuffs. Officers safely remove the children from the scene. The 29-year-old who also goes by the last name Losiewicz according to Texas criminal records includes felony convictions for; theft, forgery, prostitution along with aggravated assault which caused serious bodily injury to the victim. She was later charged with Child endangerment, possession of a controlled substance and of course evading arrest. As for the infant in the car she was unharmed, Child Protective Services got involved which led to them taking the baby. She is still being held at Bexar County Jail. Misleading Opioid Marketing Forces Big Pharma To Grant $3.4 Million For Low-cost Anti-overdose Medication.